Posted Dec. 6, 2016, 6:53 a.m.
John DeGroote provided an overview of ArcSLAMM package to approximately 75 professionals at the 2nd Annual Iowa Stormwater Summit in Marion, IA on December 6, 2016. The presentation detailed the GIS tools/databases developed by the GeoTREE Center to make it easier to model urban runoff quantity/quality using industry standard WinSLAMM model. 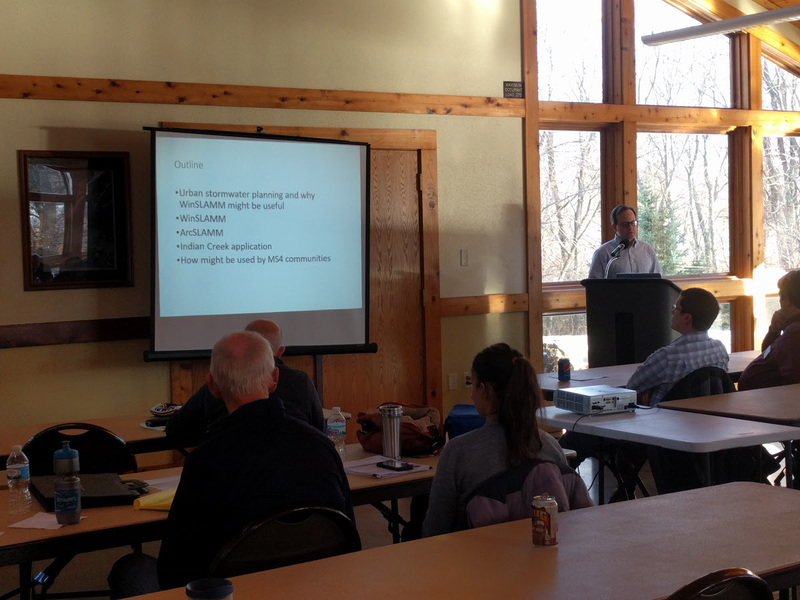 The Summit was put on by the Iowa Storm Water Education Program who invited the GeoTREE presentation. Posted Oct. 20, 2016, 6:57 a.m. 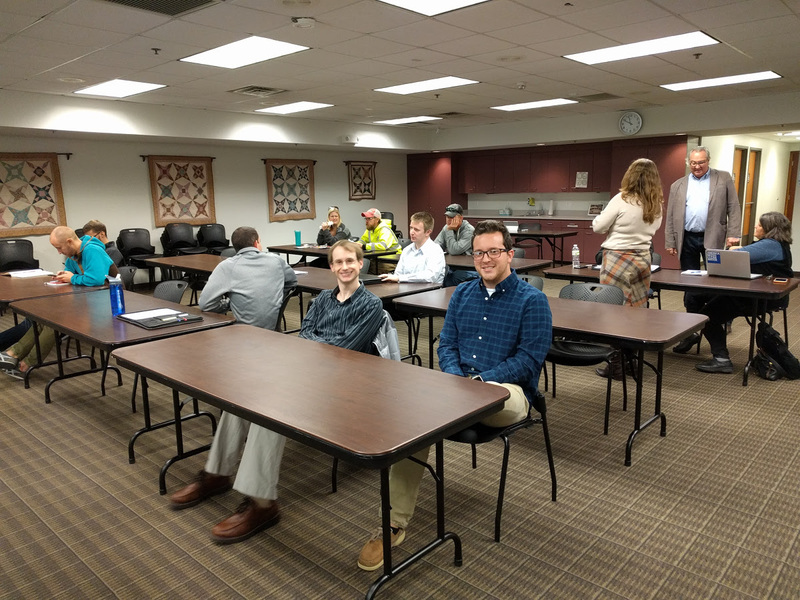 The UNI GeoTREE Center (John DeGroote and Research Assistants Garrett Jepsen and Aaron Padilla) and collaborator Rebecca Kauten provided three workshops in Ankeny, Dubuque, and Coralville. Approximately 40 attendees from local government (e.g. cities of Cedar Rapids, Dubuque, Coralville) watershed management and education groups (e.g. Easter Lake Watershed and Dry Run Creek Watershed Coordinators), and private engineering companies (e.g. Shive-Hattery, RDG Planning & Design). The workshops highlighted work the GeoTREE Center is doing under an Iowa Department of Agriculture and Land Stewardship grant to highlight custom ArcGIS tools the GeoTREE Center has developed for working with an urban stormwater modeling software. The workshops included example applications in several watersheds. The GIS tools as well as all modeling results for watersheds in Iowa will be made publicly available. Posted Sept. 8, 2016, 5:12 p.m.
John DeGroote presented a webinar in conjunction with Iowa Economic Development Authority (IEDA) Energy Office. The webinar presentation described the large data processing solar radiation modeling project the GeoTREE Center completed under an IEDA grant. The project resulted in a several order of magnitude more detailed mapping of solar radiation potential and a public facing web mapping application which can be accessed by anyone including individual property or business owners who would like to investigate solar potential of their property/building or solar installation companies who can use the application to do preliminary investigation of solar radiation potential anywhere in the state of Iowa. 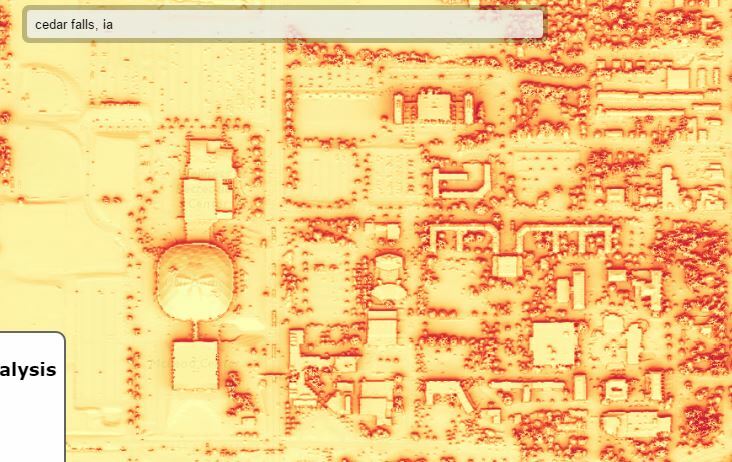 This web mapping application and underlying database are called the Iowa Solar Asset Mapping (ISAM) tool. The webinar was attended by individuals from academia, private companies, government agencies, and non-profit organizations. 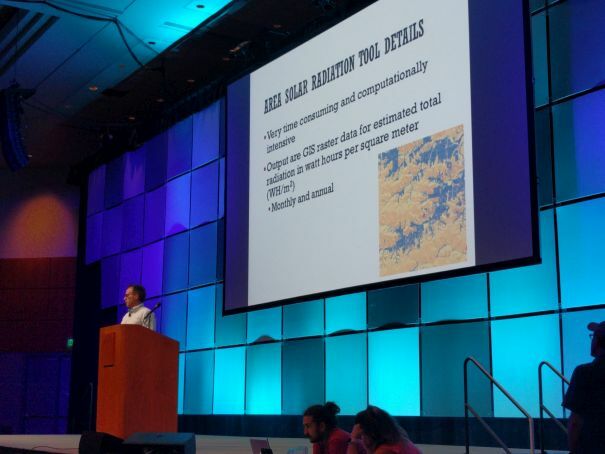 Posted July 6, 2016, 6:58 a.m.
John DeGroote presented at the ESRI User Conference on June 27, 2016. The presentation provided details on the GeoTREE project carried out for the Iowa Economic Development Authority Energy Office. The project entailed modeling/mapping of solar radiation potential for all locations in Iowa. The project resulted in the Iowa Solar Asset Mapping portal. The presentation was selected in a competitive process for the lightning talk session which highlights creative GIS applications. 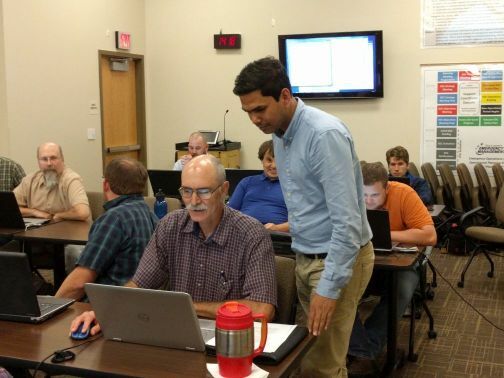 Posted June 10, 2016, 6:58 a.m.
John DeGroote and student Arif Masrur provided two half-day pre-conference (Iowa County Information Technology - ICIT) workshops in Des Moines on June 14, 2016. The workshop topics were beginning and intermediate GIS Programming focusing on the use of Python for automating ArcGIS workflows. The workshop was attended by approximately 20 local and state government and private industry personnel from throughout the state. Posted Feb. 22, 2016, 3:41 p.m. The GeoTREE Center is presently working on an Iowa Economic Development Authority Energy Office funded project. The goal of the project is to model solar radiation potential for the entire state of Iowa. The modeling utilizes Light Detection and Ranging (LiDAR) topographic data and ArcGIS Solar Radiation modeling tools. The result is modeled monthly and annual solar radiation for every location in the state. The GeoTREE Center is also developing a public facing web mapping application to display the results. 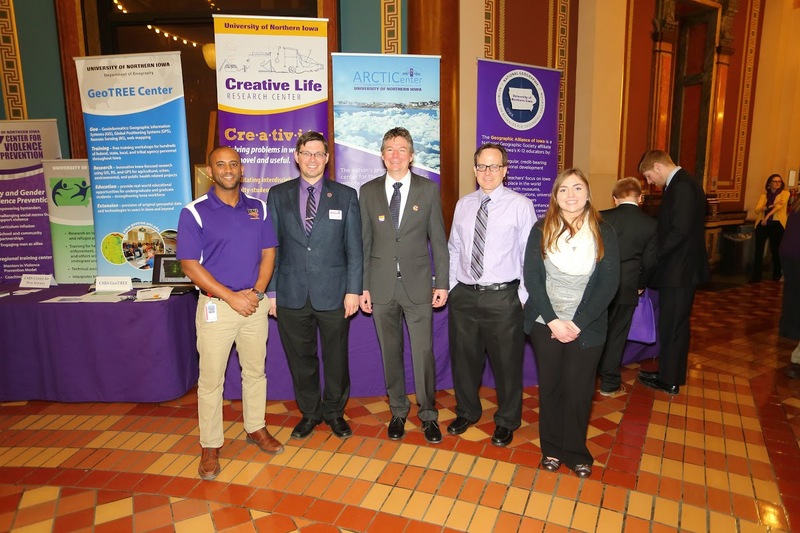 GeoTREE Center Director John DeGroote and student research assistant Megan Schneider attended the 2016 UNI Day at the Iowa State Capitol on February 24. This was an excellent chance to explain to state legislators, staff, and others the important work that UNI does across the state of Iowa. Megan got the chance to personally meet her state legislators including receiving a tour of the Capitol. 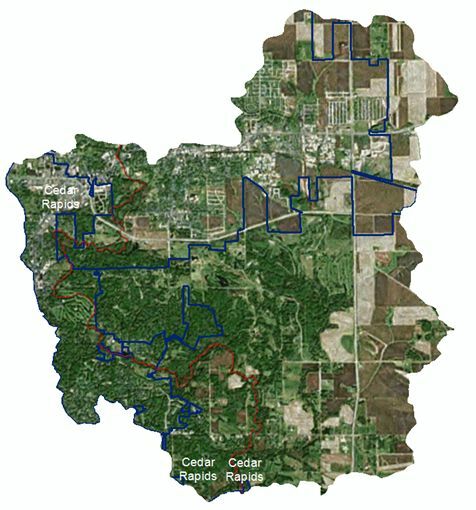 As part of an Iowa Department of Agriculture and Land Stewardship project, the GeoTREE Center is working on developing databases and carrying out urban water quality/quantity modeling for several watersheds in Iowa. This work is being carried out in Indian Creek in Linn County, Catfish Creek in Dubuque County, Easter Lake in Polk County, and Storm Lake in Buena Vista County. The GeoTREE Center will use these watersheds as demonstrations projects for the use of a GIS-urban stormwater modeling system to effectively characterize urban runoff and the potential for improvements with the introduction of Best Management Practices (BMPs).